Build-A-Bear is known for having all kinds of cool stuffed animals you can, "Adopt," have stuffed in the store, and buy a bunch of accessories. It is a brand known for lots of cool characters and outfits, but not for being cheap. Hence, when a promotion was announced call, "Pay Your Age," which involved the person the bear is purchased for only having to pay what their age is in years, it got some buzz. I mean, if your kid is five years old you just have to pay five bucks for a cool bear--and then most likely more for all the outfits and accessories, but it's still a good deal, I would think. Everyone else thought so too because it was pandemonium at Build-A-Bear stores. People lined up hours before stores opened, lines of more than a 1,000 families, and before it even really got going the whole thing had to be shut down due to concerns for safety in regards to overcrowding and such. 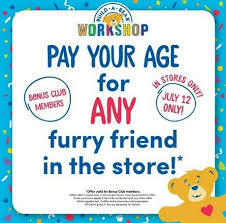 Build-A-Bear fell into its own trap of having too good a deal. Now everyone is mad and the company's CEO has been having to apologize on National Television for this fiasco. The company has been offering various things to consumer as an apology, such as as $15 credit and continuing to offer, "Birthday Treats," bears to kids under 14 in the month of their birthday. Hopefully it will at least help a little bit to assuage the angered parents and their children who were let down after waiting hours only to go home empty-handed. This will probably cause Build-A-Bear to take a bit of a hit PR-wise, but in the end they can claim it was an effort to do something nice for customers that unfortunately backfired, so it isn't as bad of a look as it could've been. I mean, it was such an effective campaign consumers, "Went nuts," so I guess it shows there is plenty of demand for the product. The key element is to for the company to keep offering deals, just not deals so good it causes chaos.